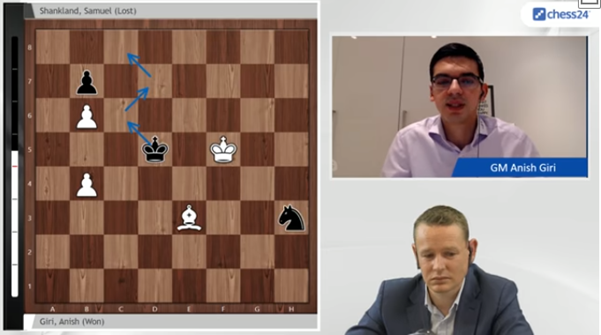 I have felt a need for a while to talk about the Giri – Shankland game. But obviously I do not want to give an inside story. Those are dull anyway, it is always the height of the ceiling or this and that. Because this was not about chess or chess understanding, as anyone who knows anything will know. I was sitting in the cinema watching THE FAVOURITE with Kallia, telling her Sam had made a draw. Then five minutes later she said he had lost. I did not believe it. How can you lose this position? Sam’s manager, I and any idiot on the Internet was able to see that this was a fortress, whether or not they had read a New In Chess pocketbook or not. But Sam had indeed resigned in the position I had seen. I hope this example will be an encouragement to people that even GMs have bad days and that it does not define them. On the next two days, Sam beat Nepomniatchchi and Kramnik and finished the tournament on 50%, winning six rating points. After Kramnik’s retirement, organisers have received statements from the Indian and Israeli Federations, not to have Sam play with Anand or Gelfand in the last round, as losing to Sam can be a career ending experience, as both Judit Polgar and Vladimir Kramnik can testify. Thanks for exposing me to yet another form of PATHOS. Also, Inside Stories are never dull. What a sad article… Kramnik, Anand, Polgar these were great players…. I don’t understand what the reference to the “error” is; there was no such “error” in Navara-Melkumyan, only clever defence by Melkumyan?! I assume JB was referring to Navara’s error of failing to anticipate the fortress. At some point in the endgame, he could have won by advancing his pawn along the a-file, rather than recapturing on b4 which allowed the clever defence. Apologies I did get the 2 players mixed up. 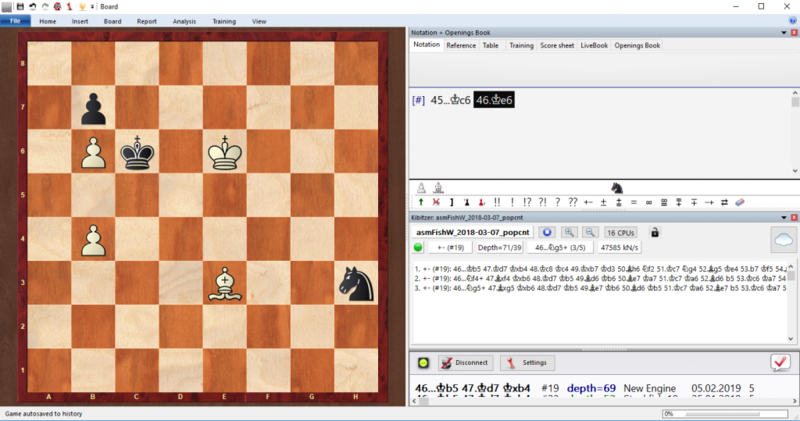 It was just like Andrew noted getting a passed a pawn on move 61 won rather than the b pawn. Obviously Melkumyan knew exactly what he was doing though you could see the penny had dropped eventually with Navara due to some of the moves he made but it was too late by then. So what does Sam do- any or all of these or something entirely different? Thanks… Have the books but Sam isn’t Jacob so he may have his own system. Jacob’s definition of calculation is a bit idiosyncratic. I can’t imagine how a response could be appropriate. CT-Art has lots of endgame positions, a lot of them studies or parts of studies. More with each new edition it seems; most of the increases in the number of positions have come in this department. I also disagree that CT-Art is “simple”, but it depends on your level of course. I imagine even a GM could find some of it worth training with from, say, level 60 and up. Happy to reply on this. Frank is 100% right. I worked with Sam before Wijk as I work with him all the time. We did two hours last night for example. I can share one secret, Sam is getting truly impressive. The rest is not secrets. The work we do is like the material in my books. But of course I am watching Sam closely and trying to tweak his approach, his methods, his psychology. And because I work so closely with him, what I write about calculation and other things is often a reaction to what I see him (and others) do right and especially do wrong. About idiosyncrasy. Yes, I have my own views. You will find them strongly represented in THINKING INSIDE THE BOX and in the book on Calculation I have been planning for ages, which I hope will be released as a part of a trilogy in 2020 (you all know our ability to predict dates, but please stop laughing!). CALCULATION and EXCELLING AT CHESS CALCULATION are not idiosyncratic. They are following the Mark Dvoretsky system. Mark helped structure CALCULATION – and EACC was based on his system with a few minor observations of my own added. Calculation and recognising basic tactics are two different things. My definition of calculation is to find the things you do not immediately see. For some levels, these tactical patterns are important, but for super GMs, there is not much new to them in CT-ART for example. What makes my books different to other “tactics” books, is that I base them on current top games. I spend a lot of time finding positions. And they are not “flashy” that often. I then give explanations to how they could be approached. This is high level stuff, of course. If you do not have your patterns in order, working on them as well is highly recommended. With many players stronger than I have ever been, this has given good results and they come back for the training so frequently that I am starting to have some confidence in what I am saying. Repeating this point: I especially want to move away from the aesthetic of “tactics” books, which is to have the most flashy solution possible. Online everyone with an opinion can sound arrogant. I eventually got tired of adding “as I see it” and so on to everything I said and stopped. I am not an especially confident person. I think this is an advantage, because I always double-check what I am saying and am open for other views as well. I do not claim to have “the truth” or a special system. When I write a book I am usually excited about sharing observations I find inspiring, hoping others do as well. Some people like to dismiss them as idiosyncratic and sometimes simplistic. This is fine. I like that chess is understood in many ways and played in many ways. I would not dismiss what others have done in earnestness, only say that it does not appeal to me. I have some observations that have helped some players improve. Sam is one of them. At age 21-22 he was rated 2590-2600. This made him probably 150 in the World. Looking at the players over 2700 recently, I did not find anyone else that did not make top 30 level at some point by the age of 21/22. Sam is the only one in the top 50 that has made that jump in his 20s. He is not a special talent. He is a worker. He has achieved it thought his own efforts. I have played a guiding/assisting part in this process and I am proud of that, although the achievement is his entirely. It has helped me say that “this is what I do” and if it works for you, fine. If not, I am sorry. I want to help, it is in my DNA, a strong urge I cannot suppress. But if I cannot, it is fine too. I do my best, but I am not gifted. I just try to do what I do a little better all the time. Btw. I always enjoy my ideas being challenged. Sometimes it makes it easier to explain them afterwards. At other times I alter my view. Both are wins. Here it gave me a chance to underline the difference between calculation and tactics once again, something I have not thought much about for years. Not challenging your views as wrong or right at all and the work you have done with Sam speaks for itself- its just interesting to hear whether his ‘calculation’program follows 100% your view of calculation as ‘finding the things you do not see’ as it seems to differ from most other chess books that seem to follow a definition of calculation as roughly the ‘seeing a tree of moves’ that you explicitly reject- that’s why I labelled it as a ‘bit idiosyncratic’- not necessarily wrong. That’s why I included the bulletpoint 3 in my original post which was meant to paraphrase your approach rather than other definitions of calculation that might be encompassed by bulletpoints 1 and 2- hence the ‘thinking outside the box’ in joke. The fortresses in those games are indeed interesting. Sam missed it because he was tired. There is no reason to make an excessive chess analysis out of it. His manager and I both spotted it as drawn on our phones while doing other things. And neither of us had seen that fortress before. Navara never thought about a fortress I would expect. There are many and different type of positions. This one is not too difficult, but still quite a bit of fun. But it is certainly different from positions where you are looking for the biggest tactical stroke and/or triple sacrifices.